This circuit This needs a set of points and if they are distant from the operator, they will have to be electrically operated. There are a number of controllers on the market to change the points and some of them take a very high current. 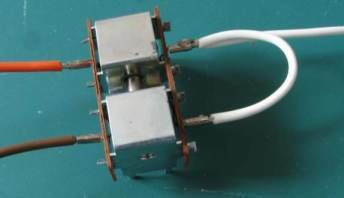 (You can get a low-current Point Motor). The high current is needed because the actuating mechanism is very inefficient, but it must be applied for a very short period of time to prevent the point motor getting too hot. Sometimes a normal switch is used to change the points and if the operator forgets use it correctly, the Point Motor will “burn-out” after a few seconds. To prevent this from happening we have designed the following circuit. It operates the Point Motor for 5mS to 10mS (a very short time) and prevents any damage. You can use a Peco switch (PL2) or an ordinary toggle switch (change-over switch – SPDT – single-pole double-throw). You can connect to either side of the Point Motor and both contacts of the other side go to 14v to 22v rail.